Spoilers ahead for all Marvel movies through Avengers: Infinity War. In Avengers: Infinity War, Gamora (Zoe Saldana) and Thanos (Josh Brolin) head to the planet Vormir to obtain the Soul Stone. When they arrive, they run into a hooded figure. He turns around to reveal a familiar face if you’ve seen Captain America: The First Avenger. If you missed that movie, you may have been slightly confused. The hooded figure is Red Skull (originally played by Hugo Weaving but recast with Ross Marquand for Infinity War), the villain of Captain America: The First Avenger. In The First Avenger, Red Skull obtains the Tesseract (the Space Stone) and uses it to make weapons for Hydra, an offshoot of the Third Reich. At the climax of the film, after fighting with Captain America (Chris Evans), the Tesseract becomes unstable and when Red Skull tries to grab it, it shoots him into the cosmos. Since then (back in 2011! 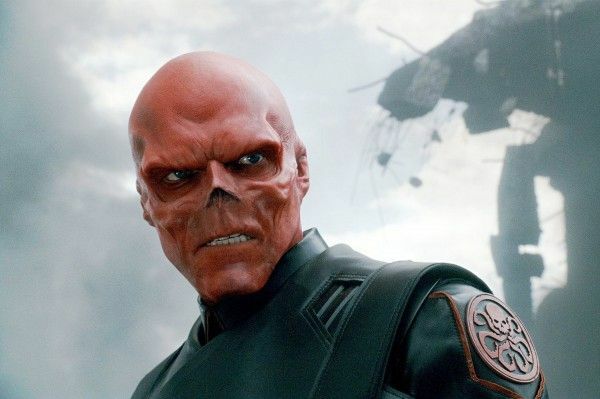 ), we didn’t know if Red Skull (whose real name is Johann Schmidt and acquired his horrifying appearance due a poor reaction with the super soldier serum that made Captain America) had been destroyed or simply teleported elsewhere. Now we have our answer. Red Skull tells Gamora and Thanos that he was teleported to Vormir and his punishment for trying to abuse the Space Stone is that he must guide others to what he himself can never obtain—the Soul Stone. In some ways, it’s a weird cameo. Why Red Skull of all people? Why not just a new character to serve as a guide of the Soul Stone? It’s not like Red Skull asks, “How’s my old nemesis Captain America doing these days?” He’s just a guide, but I assume you don’t bring Red Skull back for a cameo unless you’re planning to do more with him. Again, they could have gone with anyone for that particular task, and they went with Red Skull, so I’m inclined to believe we’ll be seeing him pop up again in Avengers 4. What did you think of the Red Skull cameo? What do you think the MCU holds for the famous villain? Sound off in the comments!